Premium Quality sealer for natural stones. Made in Italy. Tenax Hydrex Stone Sealer is an anti-stain, mineral based impregnating sealer that prevents liquids (stains) from penetrating into the stone surface through it micro-porosities. It is especially affective on polished granite and polished marbles. It is suggested for carrara, thassos, trani, botticino, marfill, and similar stones. Tenax Hydrex Sealer operates on the surface of materials and will not change the color, shade or gloss of the stone. In fact, once it dries, the sealer will be absolutely invisible but will give your stone complete protection against stains! Hydrex makes the treated surface oil and water repellent. The surface of the stone may be polished, honed or completely smooth. Hydrex allows the stone to breathe to maintain its natural characteristics. It is suitable for indoor and outdoor use. Sealing your stone surface is a part of maintenance and depending on use, the sealer should be reapplied every 12-18 months. DIRECTIONS FOR USING TENAX HYDREX SEALER: This product must be evenly applied on a clean, dry surface. 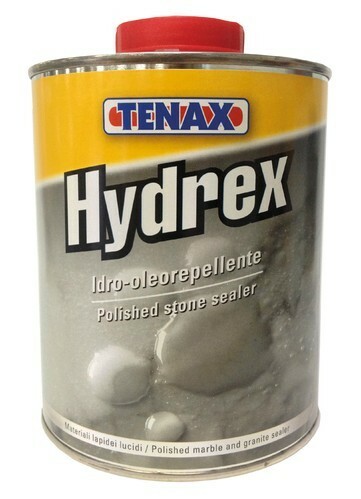 Spread Tenax Hydrex Stone Sealer evenly using a clean sponge or cloth. Apply until surface no longer absorbs product. Immediately clean/buff with a clean dry cloth. Excess product may create a superficial glossy and sticky film so it is important to remove excess immediately after application. After waiting 10-15 minutes repeat procedure. If used on floors wait 24 hours before walking on surface. 1 liter of Tenax Hydrex Stone Sealer will treat approximately 65-100 square feet of stone depending on the porosity of the stone. IMPORTANT: When using Tenax Hydrex Stone Sealer for the first time we suggest testing on a small hidden area first. Reseal bottle after use. Keep away from heat, humidity and sunlight. Please read instructions and safety data sheet (available on website) before use. Tenax Hydrex Stone Sealer will last at least 2 years if stored between 64°-77° in the original container.